I came for the food; I stayed for the story. Sasha Martin’s book begins with the remembrance of life with her brother and eccentric mother. After her mother lost her investments, life in a low-income and unconventional home was both rough and imaginative. As a result of their mother’s ways, Martin and her brother spent time in a number of foster homes, eventually being taken in by the family of her mother’s childhood friend. Though situations were often difficult and hurtful, only for a brief moment did I feel sad for Martin; I simply felt drawn into her life. When she left the family for college, and then to find work in Oklahoma, I was happy to follow. Finding herself, happiness, and success wasn’t easy, but Martin wrote about the process in such an absorbing way. In Tulsa, Martin met the man she would marry. His love for her is obvious in that, though he does not have adventurous tastes, he still supported her undertaking to cook a meal from a country each week and to blog about the experience. In addition to recipes from this experience, Martin includes beloved recipes from childhood that her mother collected whenever she had the chance. 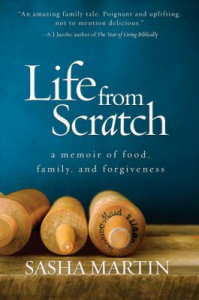 As I read Life from Scratch, I admired that this woman is such a great cook and talented writer. After reading the book I looked up her blog, Global Table Adventure. I was pleased to find, even with all her gifts, she sincerely seems humble and approachable. Whether you come for the food or for the memoir, I think you’ll enjoy staying for both.